It was a fun-filled day for 25 Smart Reader Kids® students where they visited Lok Kawi Wildlife Park on 23rd February 2019 (Saturday). Students of Smart Reader Kids® (Golf Garden), Smart Reader Kids® (Taman Landmark) and Smart Reader Kids® (Taman Jumbo) were accompanied by their parents and teachers to distribute animal food and partake in activities organised there. Smart Reader® Worldwide Sdn Bhd and its subsidiary Aim Smart Academics Sdn Bhd, as well as parents of the students voluntarily gathered resources to buy animal food which consists of fruits and vegetables such as spinach, sweet potatoes, carrots, bananas and apples. According to Noor Zaimah Binti Adnan, Development and Operations Executive of Aim Smart Academics Sdn Bhd, the purpose of this visit is to spread awareness about the animals’ welfare condition and improve its condition by giving back. “We want the young children to learn how to appreciate and care for the lives of animals. 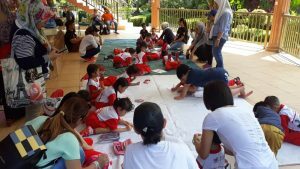 Besides, this is a good activity that helps foster family bonding time and expose the children to ‘give back’ to the community around them,” said Zaimah. Amongst the activities the children took part in was Animal Colouring Session, and watching the Animal Show on snakes andparrots. The children also learned fun facts about the animals by the zoo personnel during the tour. Also present was Abdul Malek Bin Rashid, Head of Visitor Management of Lok Kawi Wildlife Park. Lok Kawi Wildlife Park was founded on 17th February 2007 and since then it has been home to inhabitants such as Proboscis monkey, Borneo Pygmy elephants, Malayan tiger and a few deer species.